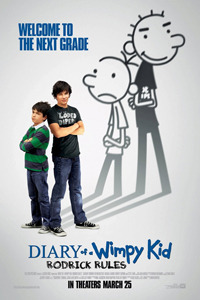 In this sequel to 2010’s surprise hit, Greg Heffley, the kid who made “wimpy” cool is back in an all-new family comedy based on the best-selling follow-up novel by Jeff Kinney. As he begins seventh grade, Greg and his older brother – and chief tormentor – Rodrick must deal with their parents’ misguided attempts to have them bond. Check out these cool games for Diary of a Wimpy Kid: Rodrick Rules! Visit the Wimpy Wonderland Island on Poptropica! Join Greg, Rowley, Rodrick and the rest of the Wimpy Kid characters for a snow-capped adventure. Help find Greg's little brother Manny before the rotten Whirley Street kids do. It's time to get Wimpy! Join the two million wimps who have created and shared their own wimpy characters on the newly relaunched site www.Wimpyourself.com. Wimp Yourself today! Rodrick and his band Loded Diaper are challenging YOU to a Rock Duel! To accept the challenge, simply post a video response to Rodrick's Band Challenge video. Grab your band, friends or big brother and give it your best shot. The winner, as selected by Loded Diper will receive a special copy of the "Rodrick Rules" book, signed by Jeff Kinney. Visit the official Diary of a Wimpy Kid site for more info! Out of all the potential social school landmines, which one would you most likely wish to stay clear off?